Bring your outfit to the next level with this glam, cushion-shaped set. 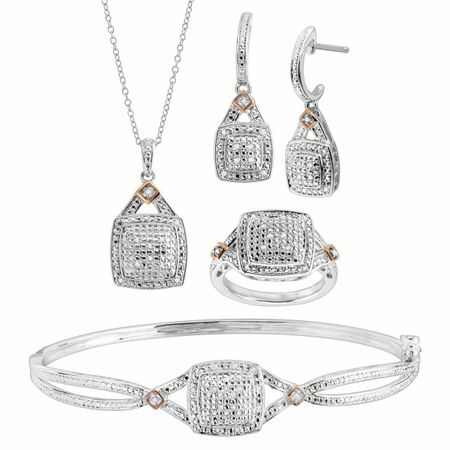 This set features a diamond-studded pendant, bangle, earrings, and ring, totaling 1/5 ct, all in a setting of sterling silver-plated brass with subtle rose gold accents. Bangle measures 7 1/2 by 1/2 inches. Ring face measures 7/16 by 7/16 inches. Earrings measure 1 1/8 by 3/8 inches and feature posts with friction-backs. Pendant measures 1 by 1/2 inches and comes with a rhodium-plated brass 18-inch cable chain with a spring ring clasp.